Peter Tosh’s music came alive as world renowned reggae artists took the stage after the October 22, 2016 opening of the Peter Tosh Museum for a benefit concert. The newly developed museum is dedicated to the life, music and legacy of the iconic reggae star Peter Tosh. The Peter Tosh museum is located in New Kingston, Jamaica inside of the Pulse Centre. 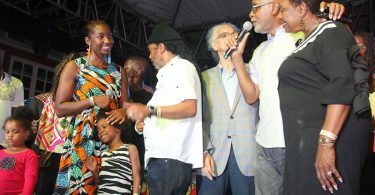 The reggae stars paying tribute to Tosh included Chronixx, Luciano and Andrew Tosh. The benefit concert also included a reunion of the original members of Peter Tosh’s backing band Word, Sound and Power. The is band comprised Sly Dunbar (drums), Robbie Shakespeare (bass), Mikey Chung (rhythm guitar), Steve Golding (guitar), Robbie Lyn and Keith Sterling on keyboards, Carlton “Santa” Davis (drums), George “Fully” Fullwood (bass), and harmonisers Carlton Smith, Derrick Lara, and Junior Moore of The Tamlins. Here are some photo highlights of the event. Long Island Freddy McGregor’s album release party at the Mixx Restaurant and Lounge.